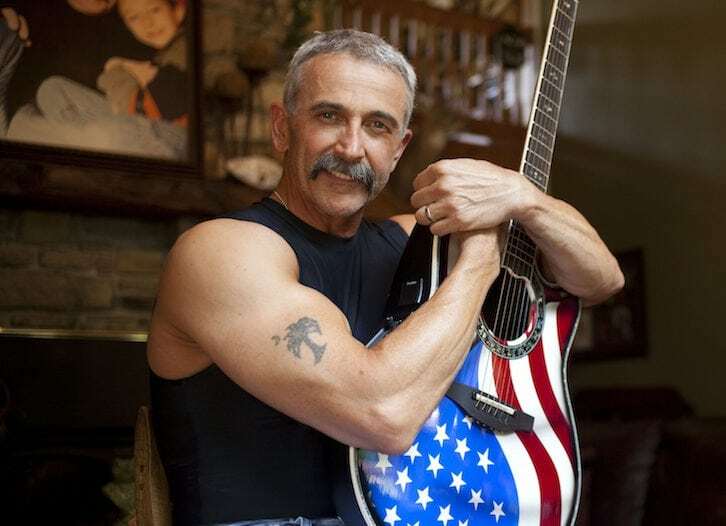 Aaron Tippin turned his experience as a factory worker in Kentucky into songs that reflected the values of other blue-collar people. Several songs on this list, plus the overlooked "Lookin' Back At Myself," back up this public perception of Tippin's life and art. That said, his output isn't limited to workman-like anthems and the occasional display of patriotism. Diving into his catalog, there's actually more good songs about love than any other topic. For other sweet sentiments beyond the top 10, check out the upbeat "If Her Lovin' Don't Kill Me" and "Ten Pound Hammer," the line dancing-friendly "She Made a Memory Out of Me," the husband-wife duet with Thea Tippin titled "Love Like There's No Tomorrow" and the slowed-down "I Wonder How Far It Is Over You," "For You I Will," "Whole Lotta Love on the Line," "The Sky's Got the Blues," "I Promised You the World" and "Without Your Love." Those examples of Tippin saying "I love you" in a song add up to a whole separate top 10 list. Regardless of the song topic, Tippin is a straight-shooter, never asking listeners to read between the lines when he's singing about love, life, and liberty. Based on the following list, his hits from the '90s and early aughts sound as fresh now as just about anything from that time period. While Tippin's image as a strong-willed, hard-working redneck drives most of his better material, he's also found some success flaunting his sensitive side. 9. "That's As Close As I'll Get to Loving You"
Tippin has got a good, whiskey-weathered voice for songs about broken hearts and regrets, as evidenced by his best love song. 8. "There Ain't Nothin' Wrong With the Radio"
It sounds like this truck is held together with chewing gum and rubber bands. But dang it, there ain't nothing wrong with its sound system! This fun song makes you want to drive around blaring the guitar work on "The Call of the Wild," followed by Tippin's cover of "I Can Help" and his drinking man's ballad "A Real Nice Problem to Have." Tippin tips his hat to the common working people in his audience with this celebration of folks who tote a toolbox instead of a laptop case. 6. "What This Country Needs"
Some things never change. Back in 1998, Tippin lamented the state of country music. Even if he's having fun here, the song is built on still valid arguments that even the most argent listener of country radio knows by heart. 5. "I Got It Honest"
From its fast-driving acoustic accompaniment to its celebratory lyrics about regular folks' lives, Tippin does his best job here of speaking for blue-collar Americans. It's a theme he visits on the light-hearted "Honky-Tonk Superman" and "Big Boy Toys." 4. "Where the Stars and Stripes and the Eagle Flies"
Tippin counts his blessings while considering the freedoms and privileges afforded to Americans with this musical reaction to the 9-11 terrorist attacks. 3. "I Wouldn't Have It Any Other Way"
This tough-as-nails honky tonk throwback helps establish Tippin as a country boy with a deep appreciation for country music tradition. The best part of this catchy hit off 2000 album People Like Us seems forgotten. Tippin is basically the anti-bro, applauding a woman for shutting down a lousy ex. On the flipside, he tells of a strong female lead who's looking for love in "She Feels Like a Brand New Man Tonight." 1. "You've Got to Stand For Something"
With a chorus that's as quotable as Travis Tritt's "Here's a Quarter (Call Someone Who Cares)," this '90s country classic justifiably defines the career and character of its performer. This post was originally published on June 19, 2018.